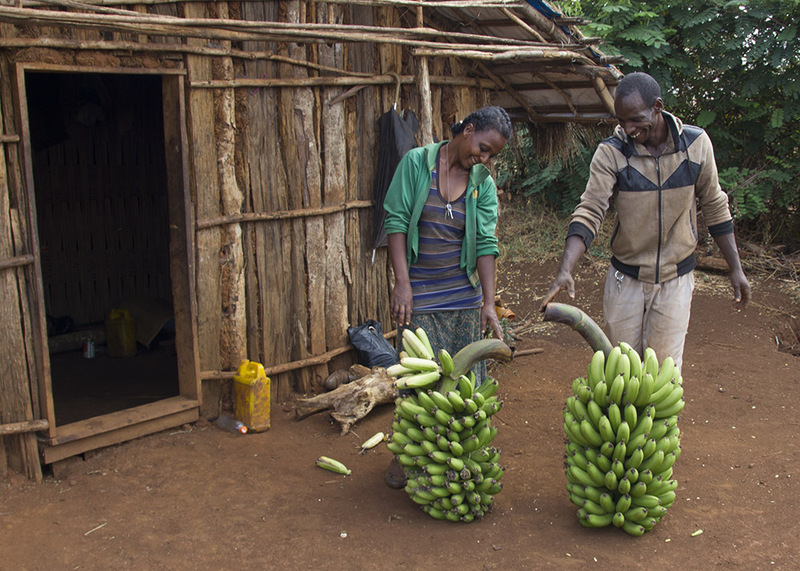 Yohanis with his wife and two bunches of home-grown bananas. Did you buy insurance this year? Most Canadians did. House insurance, car insurance, medical insurance, life insurance - we like to protect ourselves against unforeseen crises, no-fault accidents, and a future we can't always control. Insuring our futures is the smart thing to do. If you don't have insurance and catastrophe strikes from out of nowhere, you're pretty much hung out to dry. A wildfire could consume your home and all your property. A reckless driver could rear-end you on the highway. An everyday illness could develop complications. We rely on insurance, not only for our own peace of mind, but also to protect the ones we love. But if you're living paycheck-to-paycheck, you don't have any margin to pay for insurance, let alone put money away for a rainy day. And that's the reality for over 900 million people in the world. They make less than $1.90 a day and truly live hand-to-mouth. They don't always know where their next meal is coming from. They have no protection against the future. >>> Click here to find out how you can help a family in poverty get ahead. Yohanis Deslegn is a hard-working, Ethiopian man in his early forties. He used to support his family as a day labourer earning less than $1.90 a day, and it simply wasn't enough. Yohanis tried to cultivate sorghum to feed his family, but the soil on his land desperately needed replenishing. Some days his children only had one meal to eat. His wife walked long distances to forage for firewood and to collect water. Their daily lives were precarious, their future unknown. In 2012, however, Yohanis had the opportunity to take agriculture workshops with FH. An eager learner, Yohanis quickly put into practice what he'd been taught - micro-irrigation, composting, inter-cropping, and a host of other redemptive agriculture practices. 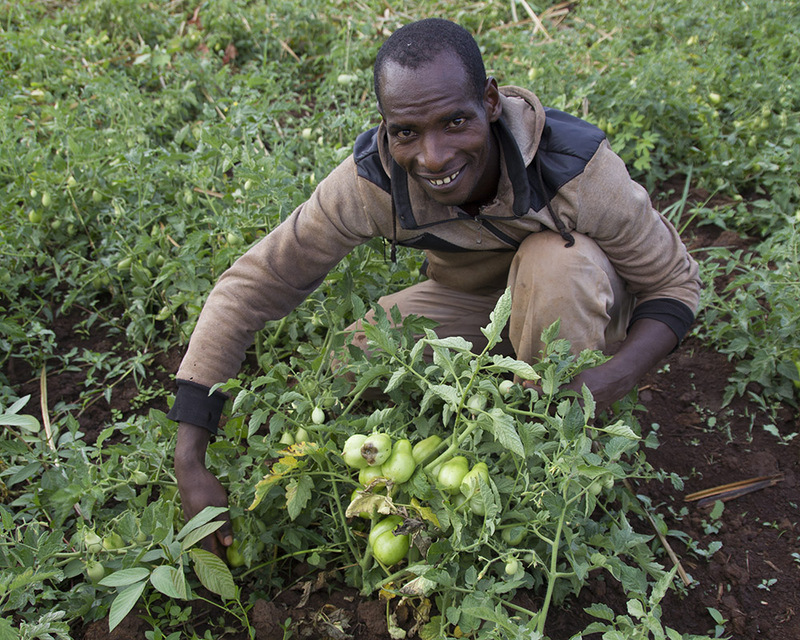 With the farm tools and improved vegetable and fruit seeds he got from FH, Yohanis was able to rehabilitate his malnourished soil. He set up an irrigation system, diverting small amounts of water from a local stream so that even in the dry season his farm would be green. Instead of spending money on chemical fertilizer, he makes his own organic fertilizer. Soon, he was harvesting 1.5 hectares of vegetables and fruit, including tomatoes, peppers, cabbage, papayas, and bananas. He quickly set up a business to start selling his high-quality produce. Yohanis poses with his ripening tomatoes. Yohanis explains, “It was due to lack of knowledge that irrigable land wasn't being farmed. After the training I started [applying the new knowledge] and discovered I could harvest twice a year. I have worked to extend my banana farm. As I produced a lot of bananas, I weekly sell three bunches in the market, as well as other fruit and vegetables." Yohanis' children also eat their fill of fresh fruit and veggies. They're well-dressed, attending school, and on their way to a thriving future. An FH staff member worked with Yohanis to conduct a market analysis and decide which crops would sell well locally and make sure that his business would be profitable. The income Yohanis now makes from his new agricultural business is affording him the opportunity to save money. For the first time in his life, Yohanis has the luxury of planning for the future. >>> Click here to learn more about how you can help a family kick-start a business. 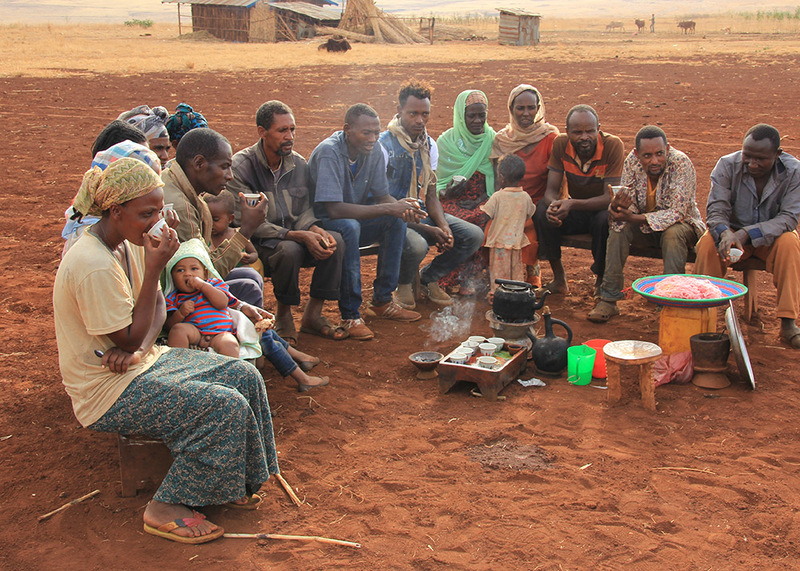 Yohanis and his family enjoy their morning coffee with neighbours and friends. FH Canada staff member, Mark, visited Yohanis around the time of Sasiga's graduation. "It was obvious from first meeting Yohanis that he was proud of his farm and took great care in tending to his vegetables. He and his family recently moved to a new house close to town so that his children could be closer to clean water and school. His whole family appreciates the improved sense of community living close to friends. During busy times, he stays at their farmhouse and works long hours." Because of Yohanis’ success, 17 other farmers from his village are imitating his agricultural techniques and have begun to improve their own lives. Impact is multiplying throughout the entire community. Mark speaks to the kind of forward-thinking man Yohanis is. "After we had taken some photos of Yohanis he pulled out his flip-phone and asked if he could get some pictures with us, too. He was also very interested in the view of his farm from the drone. Lots of locals are cautious around the drone but he stood next to me and watched the screen with great interest as we looked at his farm from above." If the rains fail this year, if one of his children gets sick, if a blight robs him of his banana harvest, Yohanis knows his family is secure. Because of his thriving agricultural business, Yohanis is saving for the future - he's growing his own insurance.